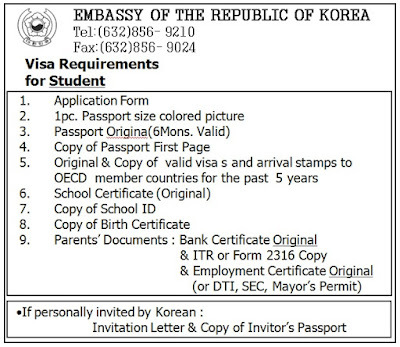 Anyways, part 1 is especially written for our visa application experiences. so we had to travel immediately. Visa - The pain of all prep pains. 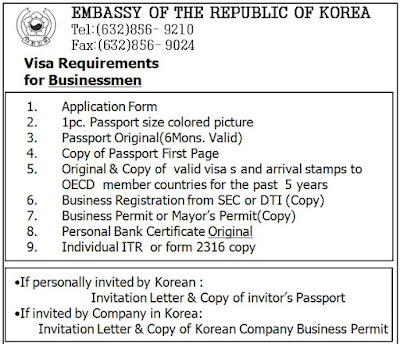 We had to return to the Korean Embassy 4 freakin times! That's 4 days in a row. Me: I didn't have a school certificate. I thought my UP Diliman Form 5 was enough. Joyce: She didn't bring a bank certificate. She brought her bank book only. Me: I got a school certificate already signed by my college dean but then the embassy personnel who checked my documents noticed that there was no issue date on my certificate. "No issue date! No issue date!" I pleaded. I begged. He said "What please?!" Grabe! So sungit! Joyce: Her documents were all complete as we thought. Me: I already brought my school certificate with the issue date. When the same embassy guy checked my documents, he returned them because my sister's alien card was apparently expired! The freak! So I had to get my sister's updated alien reg card. Joyce: Same thing because Joyce also included my sister's invitation letter and alien card as supplementary document so she also has to wait for the updated docs. Both: FINALLY COMPLETE AND ACCEPTED BY THE SAME EMBASSY WINDOW GUY! HWOOH! 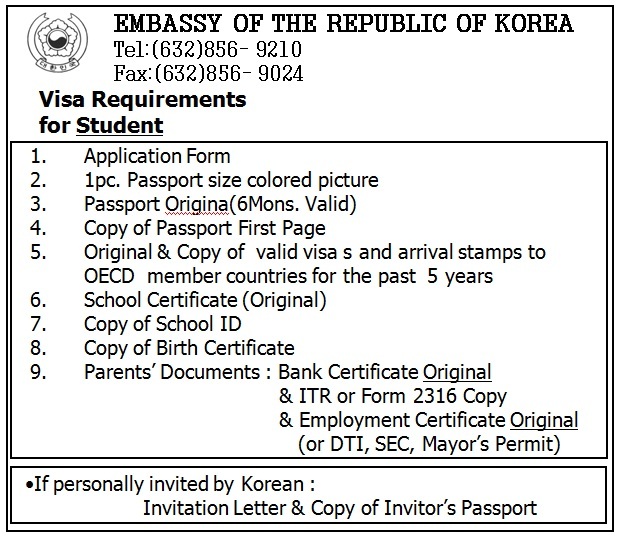 There are other requirements depending on the purpose of entry and the applicants qualifications. A comprehensive list of the requirements for the above qualifications can be obtained from this website. 2. Submission of documents is 9-11am only. 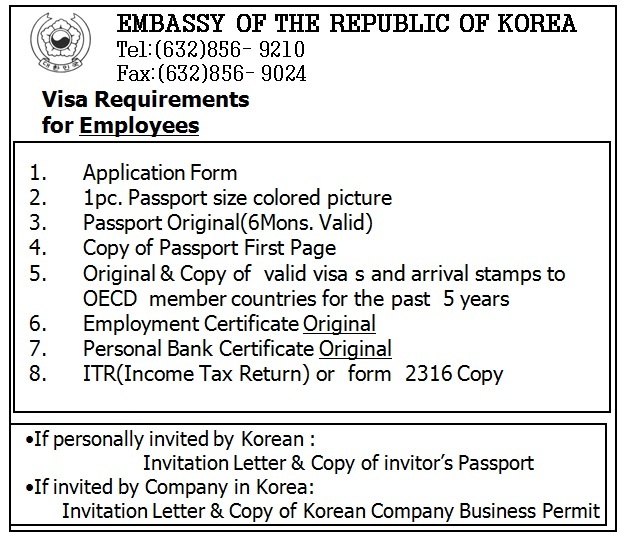 The afternoon schedule, 2-4pm, is intended for the releasing of visas applied the past week. Be at the embassy early, say 7am. Because people are already lined up as early as 7:30am. 3. Bank Certificates should indicate the amount of money you have in the bank and the date it was opened. Costs 50-200php depending on the bank. Takes about 1-3 days to be released. 4. Employment Certificate should indicate compensation and length of stay in the company. It should also have a valid landline number. You can get this from your company's HR. 5. Arrange the documents based on the list on the pictures above. The embassy personnel are strict! I promise. 6. Remove the clips, staples, envelopes, folders, etc. Just present those on the list above. Again, the embassy people are all strict! 7. 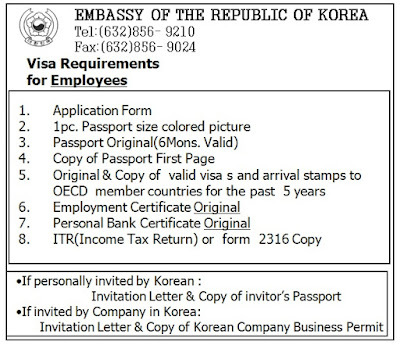 Visa is free as long as you'll stay for less than 59 days in Korea. More than that, you have to pay already. Fees are posted on the website above. Just find it. 8. Other FAQs and important details can be found on the website above, like how your visa can be denied, the effects of document fabrication, etc. Make sure you check it out. you forgot to mention what we were feeling everytime we(actually, you) face the consul.